Prismo Graphics debuted the India Pro Titler at MacWorld San Francisco 2002 to a interested motion graphics audience. 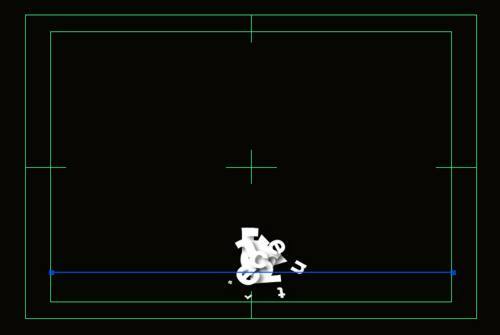 The then-cross platform package of animated fonts, canned special effects, looping textures, and objects held the potential to simplify the often tedious job of animating text. The package was so impressive that Apple purchased the company six months later. 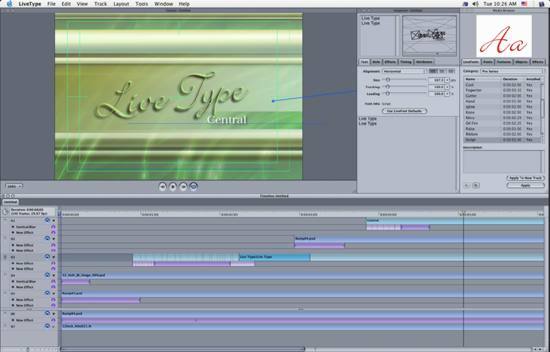 A year later, Apple released its first iteration of the program, retitled LiveType®, and bundled it with its latest version of Final Cut Pro. Since then, the program has seen a slowly growing cottage industry of companies that are producing their own LiveFonts, templates, textures, and effects. 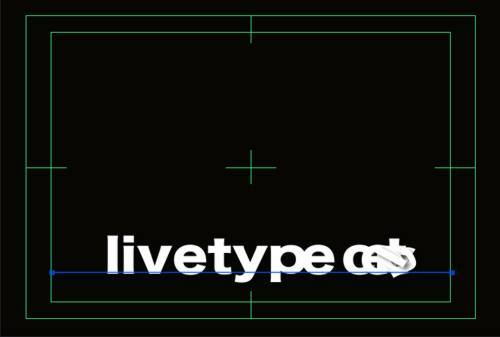 LiveTypeCentral recently "went live" with its web site that offers various add ons to LiveType. Its first efforts are both nicely done and affordable. 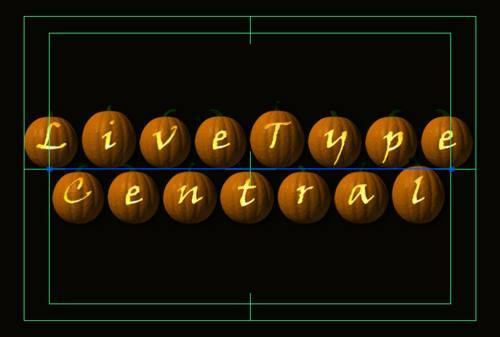 LiveTypeCentral sells individual and bundled animated LiveType fonts, an effects package, ten themed "general purpose" templates, and texture and object packages. The 23 individual LiveFonts are reasonably priced and distinctive. Volume 1 of LiveFonts includes Bank, Chopped, Chrome Tube, Freedom, Grassy, LED, Magic Metal, My Precious, Malfunction and Wet Paint. Pricing is $199.95 for the standard definition Gold Series, and $399.95 for the high resolution (HD) Platinum Series. Volume Two contains Brushed, Fancy Too, Jiggy, Liquid, Manly, Sheen, Smooth, SpeedBlok, Stainless and Wedding. These collections are only available by purchasing a DVD, although individual LiveFonts can be downloaded from the site for $34.95(G)/$59.95(P). Interestingly, I received the "Fancy One" LiveFont, not the "FancyTwo" version. LiveType Central sells its texture collections for $29.95. They include NTSC and Pal versions. As many as 27 individual "Alternative" textures are provided; a newer Weddings collection includes seven elegantly designed backdrops. Included, as well, is a collection of animated mattes. Overall, there are eight separate texture packages. Collections of static third Objects sell for $9.95. The web site provides progressive discounts depending on the amount spent. I received both sets of LiveFonts, all the templates, and the Effects package. The templates installed 12 textures. All LiveFonts except one were provided in the standard definition Gold version. One Platinum version LiveFont was provided for comparison purposes. Because Platinum LiveFonts are designed for High-Definition or Film resolutions, they are larger than Gold LiveFonts ­ up to 1 gigabyte. LiveFonts. The Bank, Chopped, and SpeedBlok LiveFonts all rotate or form into view in approximately 1-2 seconds, and thereafter remain static. Other LiveType effects can be added to further animate the letters. They are well done. The Freedom, Grassy, and Pumpkins fonts are designed for special impact as represented by their names. Freedom is US Flag based; Grassy forms letters that appear as growing grass. The Pumpkins are adorable ­ rotating pumpkins that reveal letters as glowing cutouts. Something you won't use for CNN, but nice in the appropriate circumstance. LiveTypeCentral provided me with Gold and Platinum versions of the LiveFonts "Liquid" in order to compare resolution. I scaled the point size of the same letter with different resolution fonts in separate tracks from 12 to 999 points, and immediately saw a noticeable difference in quality at that size. If you're working at with High Definition footage, stay with the higher priced, and resolution, Platinum versions. All the LiveFonts are done well, and will add a nice touch in the right circumstance. The Fancy One, Chrome Tubing, and Wedding Fonts are especially elegant. Nice static animation is found in the Jiggy, LED, Sheen and Malfunction fonts. 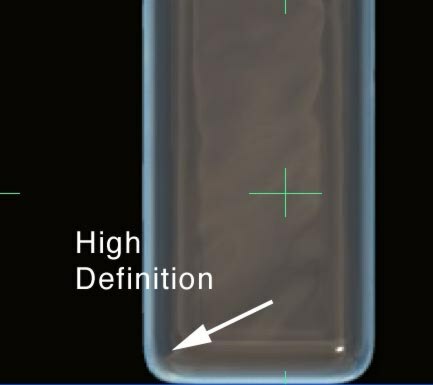 Wet Paint, Liquid, and Magic Metal are basically "paint on" type animations, but each with separate characteristics. "Freedom," as stated earlier, has a decidedly patriotic appeal as the name suggests. The web site provides small QuickTime previews of all the LiveFonts. Templates. If you are among the artistically challenged, as I am, then the LiveTypeCentral templates are a welcome addition. The templates are grouped in collections of fours: full screen information, promo, show titles and a lower third name template. They are highly animated, can be customized or altered as any template, and make extensive use of ramps, textures, and background elements ­ which can make for a lengthy render even on a fast machine. One multilayer template of eight seconds took approximately 18 minutes to render on my dual 2Ghz G5. The resulting file, however, was well timed and, in my view, professional looking. As I stated earlier, the templates are themed collections that include matched lower thirds, promotion, information, and show titles. These templates can be used to create animated menus for DVD Studio Pro, and can be customized using any of the other assets of LiveType. For the degree of animation, and amount of time necessary to create them, they are well worth the price. Several of the templates utilize Apple's ProSeries LiveFonts. Note the use of the Script below. Other templates provide view holders to insert video, still images or textures. Virtually all the promo, information, and show titles have animated backgrounds. 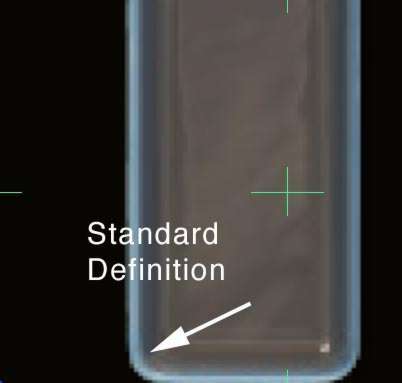 Most are approximately five to ten seconds in length, and utilize the supplied 12-in Design textures as background elements. Note, too, that most of the nine background textures supplied by LiveTypeCentral and used in the templates are from 8 to 30 seconds in length. They are drawn from the Alternative, Animated Mattes, Industrial, Smooth, Sophisticated, and Vibrant collections. The lower third templates are animated and nicely done. Again, they follow the same theme as their parent Show Titles. Most are approximately 5 seconds in length. Then letters spread out at the end. It is a two second animation. You get the idea. The web site has animated QT movies of each of the effects as well. The effects, templates, and LiveFonts of LiveTypeCentral represent excellent starting points for motion graphic novices and professionals alike. 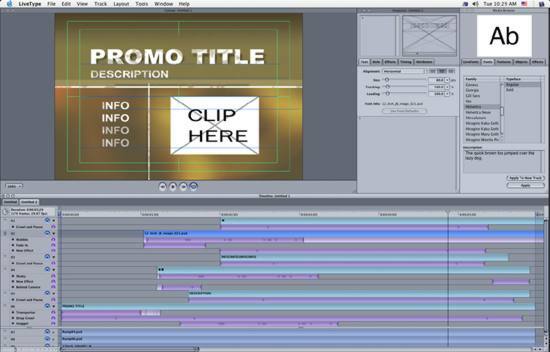 Many of the templates can be adapted for use in DVD menu creation. The LiveFonts are certainly not for every situation, and work well when well placed, and are good examples of what the LiveType technology can provide. Moreover, they are reasonably priced given the amount of time and effort necessary to create them. The animated text effects are simple, interesting, and effective. Overall, if you want to save time at the initial creation process for animated text, LiveTypeCentral is an excellent starting point. Rather than recreating the wheel, just start it rolling with these products.